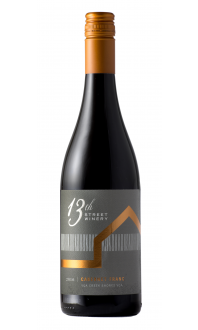 Rich and ripe fruit notes jump out of the glass with aromas of fresh black currant, black cherry and tobacco. The palate is remarkably fresh with full fruity flavours following through from the nose, a touch of spice, balancing acidity and ripe tannins. The finish is long with lingering spice character and cleansing acidity. Enjoy on release with roast bison tenderloin with plum compote. Decant to allow the wine to fully express its complexities. The wine will continue to develop with short-to- mid-term cellaring. Our Cabernet Sauvignon 2016 is a barrel selection from our Lakeshore Farm vineyard in the Creek Shores sub-appellation. The fruit was hand harvested into small bins in late October and early November. It was in nearly pristine condition so minimal sorting was necessary. The grapes were destemmed and crushed, followed by maceration and fermentation over 14 days in stainless steel tanks during which regular pigeage was performed to ensure full colour and fruit tannins were extracted. All wines were moved to 2nd and 3rd use French oak barrels of varying sizes for ageing. After malolactic fermentation they remained in oak for 14 months after which time the selection and subsequent blending of wines took place. The final blend was bottled in June 2018.